Denver Nuggets guard Jamal Murray (27) shoots over Phoenix Suns center Deandre Ayton (22) during the second half at Talking Stick Resort Arena. 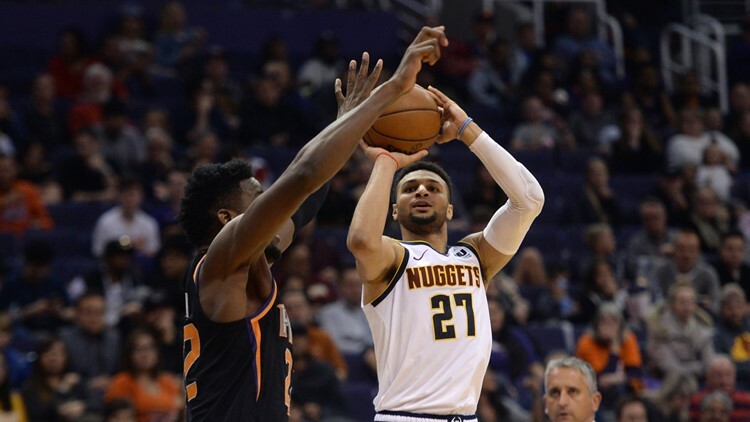 PHOENIX — Jamal Murray scored 46 points and made a career-high nine 3-pointers to carry the Western Conference-leading Denver Nuggets to a 122-118 victory over the Phoenix Suns on Saturday night. The Suns almost overcame a 23-point, second-half deficit, drawing to 113-110 on Mikal Bridges' 3-pointer with 1:51 to play. T.J. Warren hit a 3 to cut the lead to 117-113 with 30 seconds remaining, but the Nuggets closed it out with free throws in the final seconds. Rookie Deandre Ayton scored a season-high 33 points and added 14 rebounds for the Suns. Ayton made 12-of-13 shots in the second quarter for 24 points, the highest-scoring quarter by a Suns rookie and sixth-highest overall in franchise history. Suns leading scorer Devin Booker bruised his lower back in the second quarter after he stepped in to draw a charge on the Nuggets' Torrey Craig. Though announced as questionable for the second half, he returned and scored 27 points for the game, 20 in the second half. Denver led by as many as 23 in the third quarter, but a lob from Josh Jackson to Kelly Oubre Jr. with 1:37 left made the score 88-74. Ayton's hook with 19 seconds got the Suns within 90-78. Denver scored the first seven points of the fourth quarter, but the Suns stormed back to make it interesting at the end. As the Suns rallied in the fourth quarter, a fan yelled from the stands at Suns coach Igor Kokoskov. "Hey Igor, we can make some free throws!" the fan shouted. Nuggets: F Paul Millsap returned to action after missing the past eight games with a broken right big toe. ... Beasley played through a sprained left ankle. ... Murray started and played despite dealing with a tender right ankle. Five other Nuggets players were inactive, including G Will Barton (hip/core surgery) and G Gary Harris (right hip). Suns: Booker was assessed a flagrant foul in the third quarter when his hard contact on Craig sent Craig sprawling to the floor under the basket after a breakaway. ... Booker has 25 or more points in eight straight games.